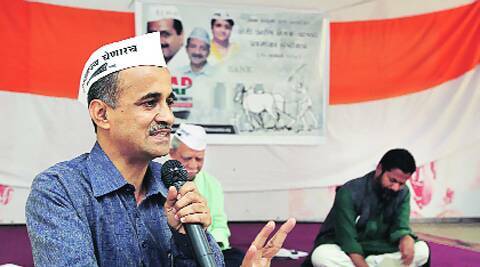 AAP candidate Subhash Ware is also planning to meet social activist Anna Hazare and seek his support. The Aam Admi Party (AAP) is going all out in preparing for elections for Pune Lok Sabha seat and has got support from various social organisations working for economically weaker sections of the society. AAP candidate Subhash Ware is also planning to meet social activist Anna Hazare and seek his support. “I am planning to meet Hazare, seek his support and request him to campaign for me,” Ware said. Meanwhile, representatives of Milun Saryajani, Janandolan, Yuvak Kranti Dal, Dagad Khan Kamgar Parishad and Lokayat held a joint press conference to announce their support for Ware. “AAP has taken up public issues and people are joining the party on their own unlike in other political parties,” said Neeraj Jain of Lokayat. Activist Vidya Bal, who has started campaigning for Ware, issued a letter pledging her support. Sandeep Barve of Yuvak Kranti Dal and Suresh Pawar of Dagad Khan Kamgar Parishad also extended support to Ware. “These social organisations have come up on their own to support me and participate actively in the campaign. There are many more who have conveyed their support to me,” said Ware. Ware said he had started meeting citizens from different sections of the society. “A lot of youngsters, including IT professionals in the city, had participated in the India Against Corruption (IAC) agitation. I have decided to reach out to them and have been urging them to be active as they were during the agitation,” he said. Party supporters were also going to slums across the city as part of a ‘Know your candidate’ drive, he added. The election campaign is being done in a decentralised way as was done ahead of the Delhi assembly polls, Ware said. On other aspirants reportedly being upset for not getting AAP ticket, he said the decision was taken in Delhi. Asked whether he would convince them to support him, Ware said he would meet D S Kulkarni and Arun Bhatia and seek their support. On the funding for the election, the AAP candidate said the national unit had conveyed that there was no fund with them for giving candidatee for campaigning and urged the candidates to raise funds. “I am raising funds from the public for the elections. We will put up the details of the funding and expenditure online,” he said.